In the upcoming weekend of college baseball, many teams play in what could be a make or break type of weekend. As the conference tournaments get closer, teams need to bring their "A" game to the ballpark this weekend. This week, we take a look at premier matchups in the SEC, ACC, Pac-10, and Big West. Included in this week�s preview is #8 South Carolina traveling to Tennessee, Clemson playing in Tallahassee against #1 Florida State, #8 Arizona State hosting UCLA, and Cal State-Fullerton traveling halfway across the country to face #13 Wichita State. The Gamecocks, fresh off a home series win against Kentucky, travel to Knoxville this weekend in what should be a close series. South Carolina got a great pitching performance from Arik Hempy last Friday, but Harris Honeycutt struggled again on Saturday. 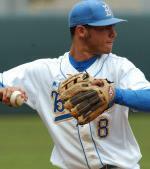 Honeycutt�s pitching this weekend will be big if USC wants to take the series. The Gamecock offense, led by Justin Smoak, James Darnell, and Travis Jones, is one of the best in the nation. SC also knows how to hit the ball out of the yard, as seen by their team total of 86 homeruns. Tennessee is also coming off a series win against Mississippi at home. The Vols beat the Rebels on Friday night with only 4 hits and rallied in the Saturday affair to win the series. Left-handed starter James Adkins has been exceptional in his last few outings, and Aaron Everett and Danny Wiltz have also done a very fine job out of the bullpen. The offense has peaked lately, doing what it was projected to do in the preseason. The key to this series will be if the Vols� Saturday and Sunday pitchers can hold down a very good Gamecock offense. Look for James Adkins to win the Friday night game but for South Carolina to rebound and take the next two. The Tigers won a close home series against Boston College last weekend and will look for that to give them some momentum heading into a matchup with the #1 team in the nation. Clemson has played well in ACC play, as seen with their 15-9 record. First baseman Andy D�Allesio and third baseman Marquez Smith have been producing in the offensive categories as of late, and that has drastically helped the Tiger offense. Starters David Kopp and Ryan Hinson, as well as All American closer Daniel Moskos, have pitched extremely well in conference play. Their ACC foe this weekend, the Seminoles, are coming off a road series sweep at Maryland. There�s a reason for them being the best team in the nation, as they hit and pitch almost to perfection. Everyone in the lineup hits over .300, with second baseman Tony Thomas Jr. hitting at a .439 clip. The three-headed pitching monster of Bryan Henry, Michael Hyde, and Ryan Strauss is not what batters want to see. Look for the Noles� combination of hitting and pitching to carry them to a series win and maybe even a sweep in Tallahassee. The streaking Bruins travel to Arizona State this weekend after winning a series at home against California last week. UCLA has been extraordinary in conference play with their 12-3 Pac 10 record and will need to maintain their conference success if they want to win an away series against the Sun Devils. Shortstop Brandon Crawford and pitchers Tyson Brummett and Tim Murphy lead a Bruin squad that has finally played up to their potential in conference play. UCLA struggled early, but has caught fire as of late. Arizona State, on the contrary, didn�t play last weekend but lost a series against Cal the weekend before that. Pat Murphy�s Sun Devils hit the ball extremely well, being led by Brett Wallace, Kiel Rolling, Eric Sogard, and Ike Davis. Josh Satow and Brian Flores are ASU�s better pitchers and help round out the pitching staff. Look for Arizona State�s offense to carry them to a series win at home against UCLA. The Titans uncharacteristically dropped a home series against UC-Santa Barbara last weekend and will look to rebound by traveling to the mid-US. Fullerton hasn�t really played up to its potential this year and will need to execute exceptionally this weekend if they want to win against Wichita State. With the exception of All-American pitcher Wes Roemer, the Titans pitching staff has not performed like it does year in and year out. The Titan offense has been mediocre this year, as seen by their .277 batting average. Cal State-Fullerton can play with anyone in the country, but the question is if they will do it. For Wichita State, one of the better teams in the nation, this is a big series. They will be playing a traditional powerhouse and will want to sweep. The Shockers� trio of starters - Travis Banwart, Aaron Shafer, and Rob Musgrave - is one of the best in the nation. Damon Sublett and Matt Brown carry the offense, which can be very good at times. Look for this out-of-conference matchup to go the Shockers� way. It�s hard to win in Wichita, and the Shockers will prove why. The Yellow Jackets swept South Florida, while UNC took off last weekend. Look for Robert Woodard and the Tar Heel pitching staff to slow down the Georgia Tech bats. As did UNC, NC State and Virginia both took off last weekend. The Cavs� pitching staff will be too strong for the NC State bats in this ACC series. NC State can�t get swept, as they�re still on the bubble. The Hogs and Tide both dropped SEC series last weekend, with Arkansas� being at home against LSU. Alabama is on the bubble and will need to win this series for SEC as well as NCAA Tournament hopes. Look for the Hogs to rebound and win a series in Tuscaloosa. The Cats and Rebels both dropped SEC series on the road last weekend. This is a huge series for UK as they�re on the bubble and need to improve their SEC resume to try to make Hoover and the NCAA Tourney. Look for UM to win this series at home, although it might be close. The Green Wave have struggled in Conference USA play, while Rice has played extremely well. Tulane is also on the bubble, and being swept would severely hurt their NCAA Tournament hopes. Look for Rice to win this series pretty handily. The Zags swept Loyola-Marymount last weekend while the Waves, like many teams, took the weekend off. Gonzaga has fared well in West Coast conference play with a 13-5 record, while Pepperdine stands at a 10-5 in league play. Look for the Waves to rebound from their series loss to San Diego and win this West Coast conference series.